Discussion in 'Video Cards' started by shadow2761, Jan 21, 2019. I cannot find any reviews on this particular card, so I cannot see what other people's temps are with this card. My card very easily reaches over 65°C even with my very aggressive fan profile. I was thinking this is a bit much for a water cooled card, there are air cooled cards out there with better results than this. My card also had plastic shrouding that ran deep into the GPU itself which could not be removed, I thought that was odd but have no idea if it is normal for this card. BTW, I am using it @ 4K and Core clocks @ 2000-2100 MHz. Does anyone else here have this exact same card, what temps are you guys getting with it? Is mine normal or could there be faults to it. Yes that plastic is normal. Kyle_Bennett has the same card and it is in his build video and he mentioned that plastic. Protective plastic removal. Just six screws. Make sure you tuck the wiring back around the blower fan so it does not touch. Armenius and Johnx64 like this. Well that video was for a RTX 2080 not a 2080 Ti and it didn't show me anything related to temps under stress. Watch again. He talks at one point about how the way the card is assembled gets some of the plastic film stuck in the cooler. I don't think he tested whether this had an effect on operating temperature, but it looks like maybe it could. Your card should be almost identical to his, physically. 65C doesn't seem out of line to me for a CLC-cooled graphics card, though. There's a big difference between a CLC and a full coverage jacket with one or more massive radiators, which is how you see "water cooled" cards getting load temps in the 30s and 40s. You can see more of my testing for personal system here. And yes, 65C peak for that card is just fine. It is about what my 2080 runs. It is an AIO, not a custom loop, do not expect custom block and loop temps, which of course would bring you down into the 30s if done right. The 280 Ti at 65C is excellent. Below is what I ran at fully stock settings with Silent fan profile running on my system, no OC. Maddness, Armenius and Dayaks like this. There is a member on OC forums that said he gets a max of 54-58°C on his Sea Hawk X with a OC. Not sure what your point is. Case air flow, ambient temperature, intake temps, lots of things coming into the mix. Is it getting fresh air from outside the case or hot air from within? My 1080ti AIOs were 59C pulling fresh air from outside the case, which were 250W cards, same as a 2080ti (at stock). If it’s using hot air from within the case I can imagine temps would be a lot higher. Armenius and Brackle like this. Maybe some pics of your build, where it is sitting and the temps around it would help? If you think your temps are too high, likely the internal case temp is too high and needs better ventilation. That is about the same temps i get on my 1080ti on an AIO. That is overclocked as well. I think that 2080ti sounds great if you ask me. Maddness, Armenius, Dayaks and 1 other person like this. Well before my Sea Hawk X 2080 Ti I had a STRIX OC 1080 Ti @ 2050 MHz and that saw a max of 65°C in the exact same case setup as I have now. All I did was take that card out and pop in the new card. But my Sea Hawk X was 70°C last night with 85% fan! 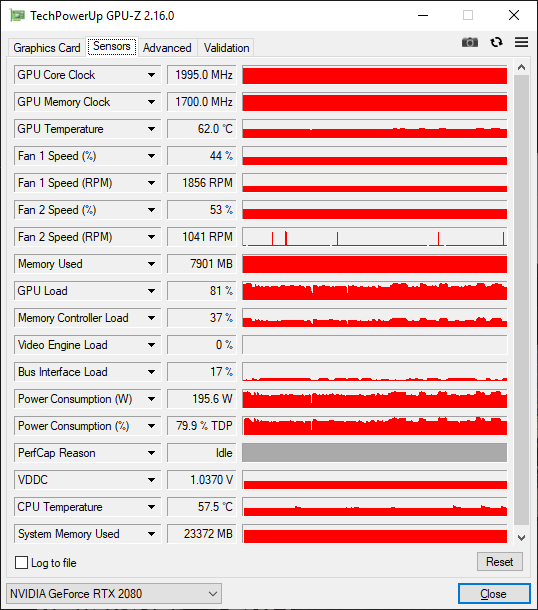 In Destiny 2 with DSR running at 4K on a 1440P monitor, I'm maxing out around 54C on my 1080Ti connected to an H55 with two Noctua NF-A12x25 fans in push-pull with an OC to 2025-2037MHz, temp dependent. I do have an aggressive fan curve because those fans are so quiet, and they are pulling in outside air. Heaven DX11 looped at 1440p hangs around 50C and speeds bounce from 2037 to 2050MHz. You still gave very little detail. Is it pulling fresh air? And like kamikazi said doing a push-pull config can help. I did that on my aios and you can lower temps with less fan speed. If it’s not pulling fresh air flip the fan around. What is the ambient temperature of the room your PC is in? Temperature delta is more important to know than absolute temperature. The EVGA hybrid kit was similar to the Sea Hawk, and my Titan X typically performed in gaming with a temp delta of around 30 degrees Celsius with the radiator setup as exhaust with a single fan pushing air out through the radiator. What is the make and model of your case? Did you move the radiator around to free up any air bubbles before mounting it in your case? Did you install the radiator in a position in your case that is above the video card? Are the tubes on the radiator positioned at the bottom when it's installed in the case? Is the radiator setup as intake or exhaust? Are the rest of the case fans setup for positive pressure? Is the peak temperature you're reporting the result of normal gaming or during benchmarking?